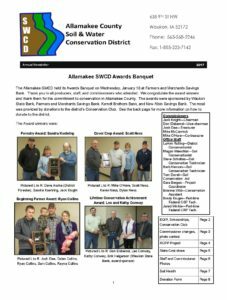 If you did not receive this year’s Allamakee SWCD newsletter in the mail, you can now access it online here. There is a lot of great information about cost-share, deadlines, and upcoming events. If you would like to be added to our newsletter list, please email sara.berges@ia.nacdnet.net or brianne.wild@ia.nacdnet.net or call 563-568-2246 ext. 3.